Tired of spending a huge amount of money on inefficient WordPress helpdesk plugins? Do you want a plugin that increases the efficiency of your Customer Support Team, without being hard on your budget? Here are the 5 best WordPress HelpDesk plugins that you need to check out. WSDesk-WordPress HelpDesk and Support Ticket System by WSDesk is one of the best WordPress HelpDesk plugins when it comes to value for money. The amount of functionality that it provides in the free version, makes WSDesk stand out among other plugins in WordPress. WSDesk packs all the basic features required to set up an online-support, like Email piping, AJAX based auto-refresh for tickets, unlimited agents, a custom ticket-generation form and much more, in just their free version. But apart from that, WSDesk also provides a lot of advanced features in its premium version with charges as low as $89 for a single website and $129 for 5 websites. It also includes 30 days refund policy if the product doesn’t meet customer’s requirement. Once you buy the premium version, WSDesk provides amazing performance features such as triggers and automation, where a custom action will be performed automatically based on a certain scenario. Plus, WSDesk provides free-of-cost support and access to updates for a whole year. One of the best features in WSDesk’s premium version is its ability to automatically suggest solutions through forums and articles before a ticket is even submitted. This eliminates the very need for ticket generation. Besides, unlike other SaaS-based systems, WSDesk doesn’t store your data in the cloud. So data privacy is one less thing to worry about. Triggers and Automation- it allows an action to happen automatically, once a “trigger” defined by you, occurs. Auto-tagging and auto-assigning- create custom tags and automatically assign a ticket to an agent based on the tag. Agent’s satisfaction rating- users can rate the support agent on-the-go which is shown in the reports too. WSDesk backup and restore- backup all your data and export it as an XML file, and restore it wherever whenever you want. WooCommerce integration- integrate your WooCommerce store with WSDesk. 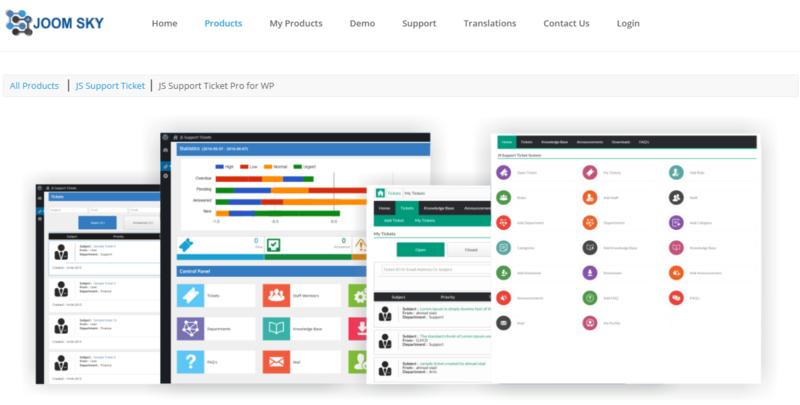 WP Support Plus Responsive Ticket System is another free open source support plugin for WordPress. It is one of those plugins, where the functionality is not at all limited and can be increased, but with an additional cost attached to it. Talking about cost, WP Support Plus offers a $99 Personal Plan for a single website and a $149 Plus Plan for 5 websites, both on yearly basis and providing access to all the premium add-ons till the license expires. Thankfully, they also have 30 days Money Back Guarantee. What else can you ask for? The free version is loaded with features such as admin and guest ticket submissions, multiple files in attachments, ability to create custom priorities for tickets, an AJAX-based auto-refresh ability for tickets and the ability to create a custom email template. When it comes to fundamental features that a support plugin should have, WP Support Plus fulfills it through premium add-ons. By using these add-ons, functionalities like Email piping, integration with WooCommerce, etc. are made possible. Plus, they also support custom features which have to be purchased from them on-demand. Google calendar event integration- integrate any event to your system directly from Google calendar. Awesome Support-WordPress HelpDesk and Support Plugin is another open source customer support plugin. It offers a WordPress like UI, which can be a head-turner for some users but for others it can be a little annoying. Awesome Support is a free-of-cost WordPress support plugin with a lot of features. But if users want additional functionality, their Standard Bundle gives you that for $149 for a single website and $199 for 3-5 websites, on yearly basis. Awesome Support provides many features such as unlimited agents, email notification for users and agents, ticket transfer among agents, custom email template and so on, in their free version. While they lack in some of the basic and advanced features, they make sure users get all that through premium extensions. Awesome Support has all the bells and whistles in the form of premium extensions including Email piping, SMS and SLACK notification to agents when a ticket is generated, internal notes among agents, priority, status, and default assignment rules, and multiple custom agent signatures. Email notification of ticket submission and resolution- get notified by email when your ticket is created and solved too. JS Support Ticket by Joom Sky is another open source, free-of-cost support ticket plugin for WordPress. Apart from being simple and easy to use, one of the main attraction of JS Support Ticket is its colorful interface. JS Support Ticket has a free version which offers many features free-of-cost. But for those who need extra functionality, there is a pro version also. In the pro version, you get to choose from three plans. For 12 months it costs $55, for 24 months it costs $99 and for 60 months it costs $199. The free version of JS Support Ticket has features like multiple file attachments, filters on tickets, ability to create unlimited departments, custom fields for tickets and ability to download a translated version of the plugin. One of the attractions of the free version of JS Support Tickets is the auto-responder feature that it provides. It allows an automatic email to be sent to the user, after creating a ticket. On top of all that, the UI is designed using Bootstrap. It is very colorful and fascinating but it can be a bit confusing for some users. On the other hand, JS Support Ticket pro version provides you access to features like Email piping, staff permissions, agent-satisfaction reports, Google ReCAPTCHA and Email blocking. Personally, features like time tracking, where system keeps a track of total time spent on the ticket, and saving the responses to most commonly created tickets for a faster reply, are among the strong points of this plugin. Ticket priorities and highlighted priorities- set custom and highlighted priorities to your tickets based on preferences. JS Support Ticket CAPTCHA and Google ReCAPTCHA- be safe against bots. Sola Support Tickets is another open source HelpDesk plugin that offers both free and premium features, that too at a very affordable price. Along with a free version, Sola Support Tickets has two other premium plans. It charges $19.99 for 3 websites per year and $39.99 for unlimited websites per year. Sola Support Tickets may be the cheapest one in the whole list but it surely doesn’t lack in features. The free version of Sola Support Tickets may not have much to offer but it acts as the base of an amazing plugin with all the premium features packed into it. From a single agent support and email notification for new support tickets to the option to add custom priorities to your tickets, the free version packs just about these features. Sola Support Tickets has got a lot of premium features to increase its functionality and to customize it beyond limits. It supports various add-ons that provide premium functionality. These add-ons allow Sola Support Tickets to enable features such as unlimited support agents, Email piping, CAPTCHA on the submission form and a multi-language support. It also provides a feature for solving most popular requests by automatically collecting data about the ticket that has been generated most number of times. Customer satisfaction survey- provide your customers with a satisfaction survey to help your team provide better service. Custom quick responses- create custom responses that will be sent for common tickets. 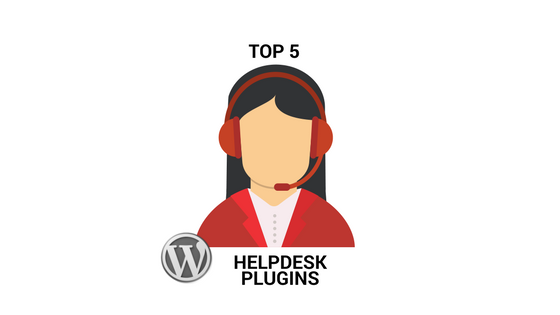 So all in all, we have listed some of the best value for money Customer Support HelpDesk Plugins for WordPress. We hope this article helped you in choosing the right support plugin for your WordPress store and in saving a bit of your money too. You may also want to check out our 9 Top WooCommerce Plugins for Free in 2017.